Black bears vary in color from jet black and cinnamon brown to white, and usually have brown muzzles; some have a white patch on their chest. Black bears (Ursus americanus) are the most abundant and widely distributed of the three species of North American bears. An estimated 100,000 black bears inhabit Alaska. The black bear is the smallest of the North American bears. Adults stand about 29 inches at the shoulders and are about 60 inches from nose to tail. Males are larger than females, and weigh about 180-200 pounds in the spring. They are considerably lighter when they emerge from winter hibernation and may be about 20 percent heavier in the fall when they’re fat. Black bears are most easily distinguished from brown bears by their straight facial profile and their claws, which rarely grow more than 1 ½ inches in length. Black bears have adequate sense of sight and hearing, but have an outstanding sense of smell. For most of the year, black bears are solitary creatures, except from June through July when mating takes place. The cubs are born in their dens following a gestation period of about seven months. The cubs are born blind and nearly hairless, weighing in under a pound. One to four cubs may be born, but two is most common. Cubs remain with their mothers through the first winter following birth. Black bears mature sexually at 3 to 6 years of age, depending upon their environment. In the more southern parts of their range, bears will breed every other year; however, if a litter is lost early during the first summer, the sow will breed again that year. In more marginal environments such as northern Alaska, black bears keep their cubs with them an extra year and will breed every third year. As with brown bears, black bears spend the winter months in a state of hibernation. Their body temperatures drop, their metabolic rate is reduced, and they sleep for long periods. Bears enter this dormancy period in the fall, after most food items become hard to find. They emerge in the spring when food is again available. Occasionally, in the more southern ranges, bears will emerge from their dens during winter. In the northern part of their range, bears may be dormant for as long as seven to eight months. Females with cubs usually emerge later than lone bears. Dens may be found from sea level to alpine areas. They may be located in rock cavities, hollow trees, self-made excavations, even on the ground. When it comes to food, black bears are creatures of opportunity. There are certain patterns of food-seeking which they follow. Upon emerging in the spring, freshly sprouted green vegetation is their main food item, but they will eat nearly anything they encounter. Winter-killed animals are readily eaten, and in some areas black bears have been found to be effective predators on new-born moose calves. As summer progresses, feeding shifts to salmon if they are available, but in areas without salmon, bears rely on vegetation throughout the year. Berries, especially blueberries, ants, grubs, and other insects help to round out the black bear’s diet. There are an estimated 100,000 black bears in the state of Alaska. Status and trends vary from region to region, and some highlights are provided. Information collected from hunters and harvested bears provides valuable insights into bear status and trends in Alaska. On northern Kuiu Island in southern Southeast Alaska, a population of 1,019 bears with a density of 1.51 bears/km2 is among the highest black bear densities known. Anan Creek, on the upper Cleveland Peninsula in Southeast Alaska, is closed to harvest because it has long been a popular black bear viewing area. Black bears can also been seen at the Mendenhall Glacier bear viewing area in Juneau. On the northern Southeast Alaska mainland, Juneau & Gustavus (GMU 1C): Hunters harvested an average of 97 bears/year in 2004-2006, a 13% decrease over the average harvest of 111 during the previous three-year reporting period. The stable skull size and age structure of harvest indicates that the black bear population may not have changed significantly. Prince William Sound and North Gulf of Alaska coast (GMU 6): When pooled in ecological units, bear densities ranged from 0.33 to 0.85 bears/km2 and the population is about 3,300 bears. Kenai Peninsula (GMU 7 and 15): The black bear population appears stable. 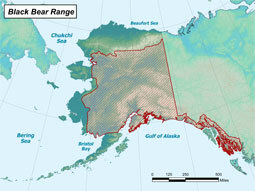 Black bears appear in greater densities along the southern outer coast, probably due to healthy salmon runs coupled with low densities of competing brown bears. About 3,000–4,000 black bears are estimated in this area. The five-year average annual harvest was 410/year. Upper Cook Inlet (GMU 14): The population of black bears in Unit 14 is likely at the upper end of the range between 500 and 1,000 black bears. Harvest increased during 2004–2007 to an average annual kill of 166 bears. West Side of Cook Inlet (GMU 16): Line-transect surveys in 2007 indicated there were about 1,888 black bears in Unit 16B. 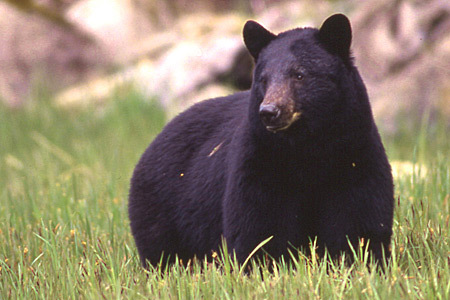 The 2004–2007 average harvest of black bears was 283 animals, much greater than 2001–2004 average of 197. Most of the increase in bears harvested is from Unit 16B where there has been an emphasis on reducing the number of bears in the unit. Portions of the Kuskokwim, Nowitna, Innoko and Yukon River drainages (GMU 19, 21A, and 21E) Based on habitat and bear densities elsewhere, the population estimate for the entire 55,278-mi2 management area is approximately 8,300–16,600 black bears, based on overall densities of 150–300 bears/1000 mi2. The population was probably stable or slowly increasing during the past 10 years, based on local observations. Central–Lower Tanana and Middle Yukon River drainages (GMU 20A, 20B, 20C, and 20F): Densities of northern black bears are relatively low compared to other areas; 500–700 bears in the Tanana Flats in Unit 20A, 750–1,200 bears in Unit 20B (west of Fairbanks), 700–1,000 in the portion of Unit 20C outside Denali National Park, and 400–700 in Unit 20F (Tanana-Livengood). Central Tanana Valley near Delta Junction (GMU 20D Based on densities reported elsewhere the manager estimated that approximately 525 bears were present north of the Tanana River and 225 bears south of the Tanana River. Occur over most of the forested areas of the state; not found on the Seward Peninsula, the Yukon-Kuskokwim Delta, or north of the Brooks Range. Also absent from Kodiak, Montague, and Hinchinbrook Islands, and from the Alaska Peninsula beyond Lake Iliamna. Twins are most common, but litters may contain 1-4 cubs. Black bears are the most abundant and widely distributed of the three species of North American bears; they have been recorded in all states except Hawaii. Black bears are abundant and widely distributed in North America, and about 100,000 black bears live in Alaska. Bluish-colored black bears called glacier bears are found in Southeast Alaska.